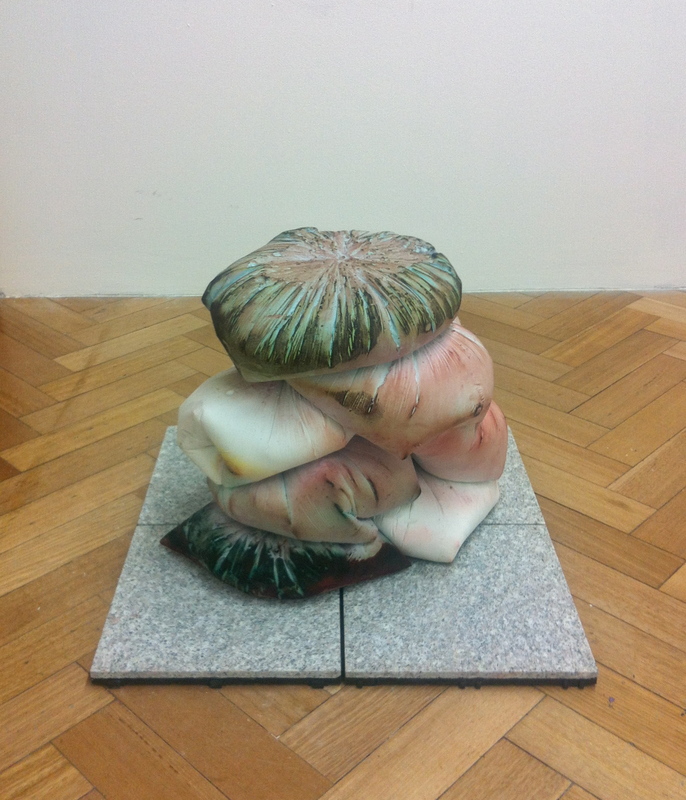 A tension of absence served on sliced volcano juice is what awaits you in Gallery 3 at West Space. Cast interiors of plastic bags slump together, draping over ropes suspending their mass from the ceiling or flopping over glass mirrors or a crystal ball. Five sculptural forms as one installation. Two on the floor, two plinthed and one hung. All variously pairing off and conversing with each other in private dialogues. The image above shows a pile of slumped plaster forms on top of a grid of four granite tiles on top of four slate tiles. I want to call the cast ‘lumpen’ forms because of their shape and then I realise maybe it’s because they keep slipping between garbage bag and shopping bag referents, dragging a political tone into the scenario. Detritus, consumerist behaviours, local council regulations and domestic concerns weigh into the debate. The domestic is reinforced by the tiles, so familiar to modern apartments, and the slate, a more outdated building material but nonetheless recognisably homely. These are also ancient and earthly materials poured out onto the surface of the planet millenia ago. Now sliced and diced into units to support our domestic environments. This relationship between materials and the questions it provokes is at the core of Adam’s work and is its strength. Throw in mirror, rope and crystal (a ball in one sculpture and a pile of Brancusi-esque candle sticks resting on a plaster slump in another), and you have a carefully crafted ensemble of relationships. The rigidity of the rectangular mirror, gridded tiles and cubic plinths plays off nicely against the bulging, ghostly plaster casts. The colour of the plaster lumps also evoke bodily connections, a visceral trigger that plays off against the hardened material. Veiny, blood sacs pinning down heavy earthly materials. This pinning down too, is a factor of intrigue. The weightiness of the slumps is their defining feature and works to best effect with the (undefined) pairing of the two sculptures in the image above. 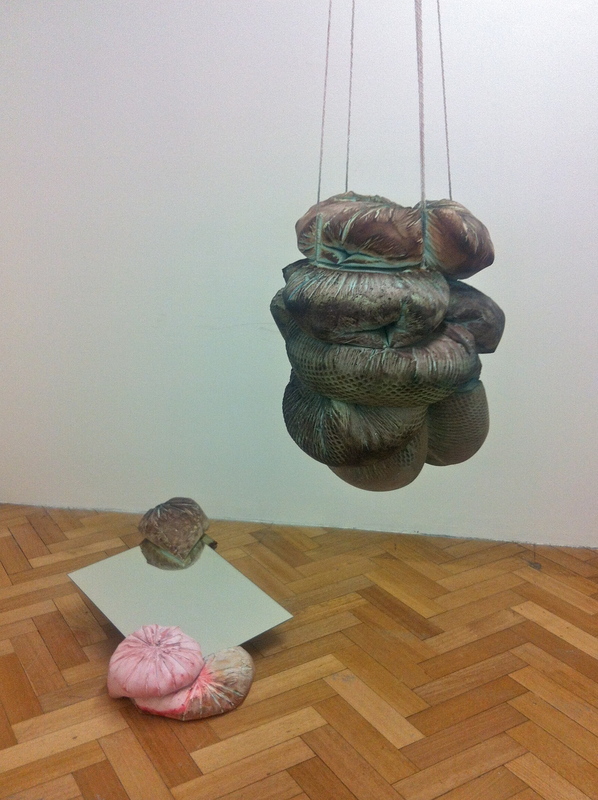 A bundle of casts sits heavily in roped suspension from the ceiling. A mirror is propped off the floor between two paired slumps of matching colour (artery and vein, perhaps. Flow out, flow in.). The mirror reflects in an upward trajectory and partners the downward trajectory of the ceiling piece. And all the while I can’t help but think that these slumps, these weights, are all just castings of the space inside plastic bags. The sort of bags that float in the breeze on abandoned urban blocks and landfills the world over. Show runs through until … speaking of rubbish … election day! Tags: Adam John Cullen, West Space. Bookmark the permalink.